This Yeovil Gothic dark amber leaded glass traditional hanging outdoor porch lantern is rated IP43 and features a handmade lantern, with rippled water glass panels, dark amber diamond stained glass inset and finished with a solid brass hook and chain suspension. The central diamond panel looks almost black when the lantern is not lit but glows dark amber when it is illuminated. 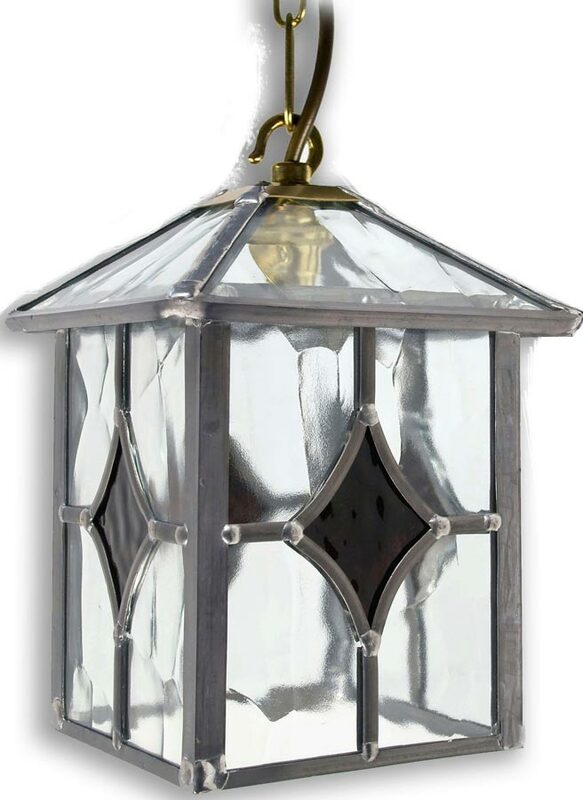 What could be more enchanting than this traditional handmade outside porch lantern that will cast the most wonderful transfixing light by night? Supplied with 20cm of chain suspension that can be shortened at the time of installation. Hand crafted in Yorkshire and featuring traditional soldering techniques, this Yeovil Gothic dark amber leaded glass traditional hanging outdoor porch lantern embodies over seventy-years of skilled local craftsmanship. Do you ship to the United States. Also what are the measurements of this lantern? Hi Christopher, unfortunately our fittings are not suitable for use in the United States. However, as this fitting is handmade I can have one converted for you. I am afraid we do not ship to the United States so carriage would need to be arranged by yourself. The lantern is 200mm high and 180mm in diameter, it is supplied with 200mm of chain. Kindest Regards, John.